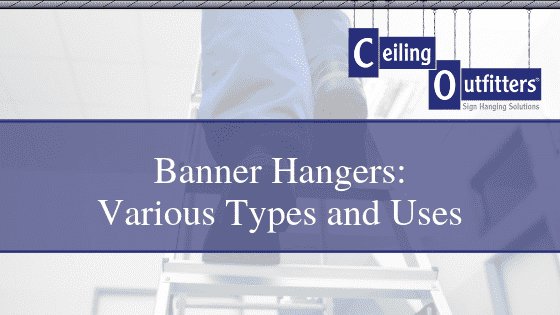 Ceiling signage can be crucial to the success your business, retail, or grocery store. Ceiling signs introduce new products, help direct customers to products they are looking for, draw attention to a sale, lead people in the right direction, and much more. 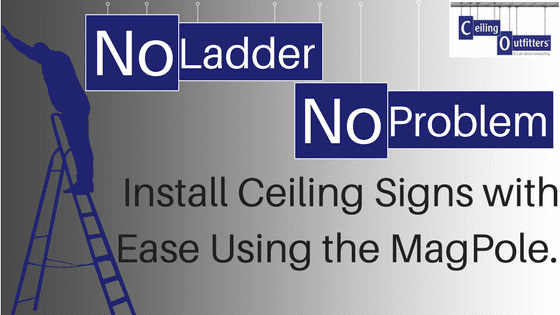 Signs are most effective when they are updated often, but it’s expensive to rent a lift every time you wish to update your signage and it’s hazardous to your employees and customers to use tall ladders when hanging ceiling signs. The MagPole™ aluminum extension pole is an easy and safe alternative to ladders and lifts. Using the MagPole™, you can reach 27-foot-tall ceilings with both feet on the ground. Recruit someone to stand against the wall below the ceiling you wish to measure. Or, you can use an object like a door, store fixture, or window…just know its height. Stand about 20 feet in front of the same wall, extend your arm in front of you and “measure” the person’s height using your thumb and index finger as shown. Continue “measuring” up the wall with the original spacing established between your thumb and finger until you reach the ceiling. Take the person’s approximate height and multiply by the number of “measurements” from the floor to the ceiling. 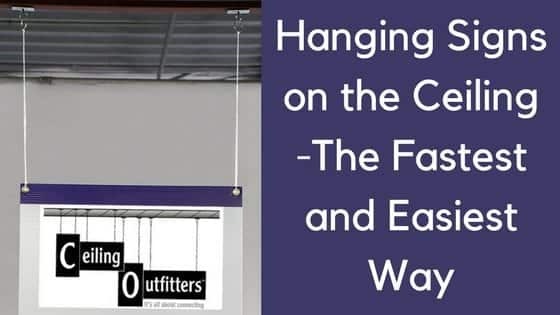 MagPole™’s sturdy aluminum and fiberglass construction allows for any employee to hang ceiling signs no matter the height; the MagPole can easily reach it. The One-Button MagPole extends 8 feet for ceilings up to 14 feet tall. The Standard MagPole extends 18 feet for ceilings up to 23 feet tall. And the Monster MagPole extends 23 feet for ceilings up to 27 feet tall. Whether you are operating a local boutique or hanging professional grade signs in a factory, the MagPole is a reliable alternative. No twisting and turning in hopes that your installation pole will stay extended. Each MagPole™ section extends and locks into place with the push of a button. Extend your MagPole to your desired height and align your magnetic hanging system to the desired location. Then, simply click your ceiling sign in place. Hanging signs has never been safer or faster! A one-time investment for your store, workplace or production facility could save you thousands in medical or legal fees. Protect your employees and protect yourself by investing in the MagPole. Since 2007, Ceiling Outfitters has partnered with over 2,000 national organizations including 22,000 retail store, manufacturing, education, and hospitality locations. 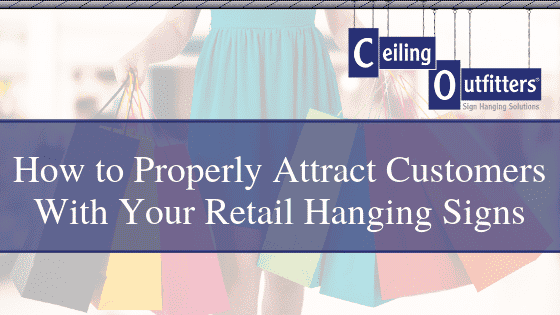 Ceiling space and storefront windows are optimal visual display locations and we help customers utilize these areas safely, quickly, easily and more economically. 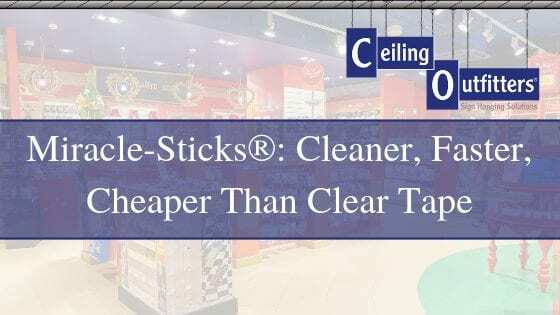 We are the master distributor of the Clik-Clik™ family of product, the premier magnetic hanging system that transforms the ceiling eco-system into a workable location for strategic placement of ceiling signs and displays and helps employees suspend items without a ladder or lifting device.